European equities have had a strong first half, with the Stoxx 600 index rising by 7.5% in Euros and 13.7% in USD. This is due to a combination of political, fundamental, and valuation factors. From a political standpoint, risks have fallen in the Eurozone as there is now a growing likelihood of stronger European Union (EU) leadership, reflected in several ways. Firstly, the French-German axis at the heart of Europe is stronger after the Macron victory. Secondly, the EU is being assertive in its Brexit discussions with the UK, which is likely to help retain the cohesiveness of the other 27 EU nations. From a fundamental perspective, Citi analysts expect 2.1% GDP growth in Europe this year, and more importantly this pickup is broadening across countries. That said, there has been little impact on core inflation which remains around 0.7%, below the ECB's 2% target. Thus the ECB asset purchase programme is expected to be extended to mid-2018 (probably with the announcement in September or October that the monthly purchase amount of Euro 60 billion is to be reduced), with mid-2019 being the expected time for the start of the interest rate rising cycle. Citi analysts are likely to see broader Earnings-Per-Share (EPS) growth of 10-15%. 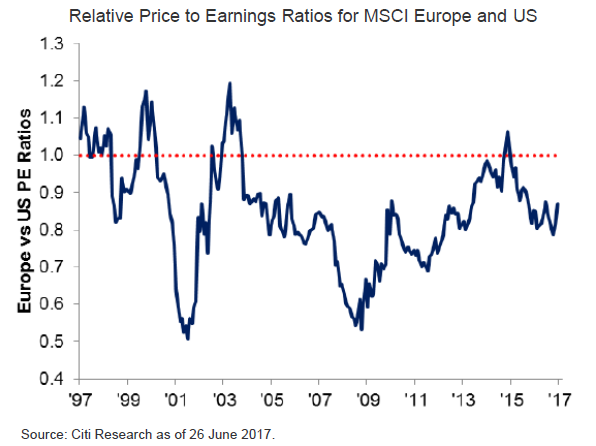 The EuroStoxx index is currently trading at 19x of earnings and still at a decent discount to US equities.